As a runner I love to hitch a ride. Not with scary strangers who wanna kill me, but with my husband. He doesn't wanna kill me. Most of the time. Hitching a ride when he goes for some grocery shopping is a great way to run a different route. Yesterday we went to visit one of the local highschools, to see if it would suit our 12-year old son. The distance from that particular school to our home is about 5 miles. So I smelled a great running opportunity! But how was I going to look both neat and presentable as a mom, and wear my running clothes? Because I didn't want a big hassle of having to change my clothes. Luckily I own a simple black climacool shirt and some ditto running tights. I pulled one of my mommy skirts over my tights, and teamed it with my black shirt. Voila, I looked quite presentable. 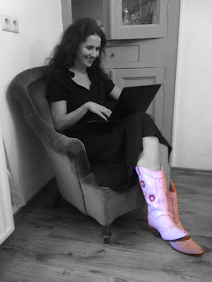 Then I put on a pair of cowboy boots, which are real easy to take off, and I was ready for the visit to the high school. After we finished there, I exchanged my cowboy boots for my running shoes, and did a quick striptease by losing my skirt. I turned myself from a mom into a runner faster than Clark Kent turned into Superman! How do you combine your day to day life with running? Any way possible! It's tough with work and kids. Sometimes it's a 5mile treadmill run at 5AM.